I had three balls of this really cool looking Karabella Aurora Melange #004, a nice tweedy chocolate brown, so I decided that a quick and easy thing to do would be to churn out another Michael Nesmith hat, sans pompom alas (I was thinking about giving the hat to my brother for Christmas, and a less pompommy guy cannot be imagined). Here’s the link to my free pattern. Although upon quick visual inspection (not the most “scientific” method, I must admit), the Aurora Melange appeared to be the same weight as the Debbie Bliss Cashmerino Aran, I felt a distinct difference while knitting. Just goes to show you the importance of a gauge swatch! The Melange was noticeably thicker and hence a little more difficult to work with at this gauge. I would recommend sticking with the Debbie Bliss for this hat, although the Aurora Melange was a real pleasure to work with. If the label’s promises about washability hold true, this will not be my last time working with this great yarn, a marled version of the classic Karabella Aurora 8. Aurora 8 and Aurora Melange come in various weights and about a million colors too. Read the Knitter’s Review write-up here. Previous Post “A Quaker Study” Finished! Next Post Where Have all the Flower Threads Gone? 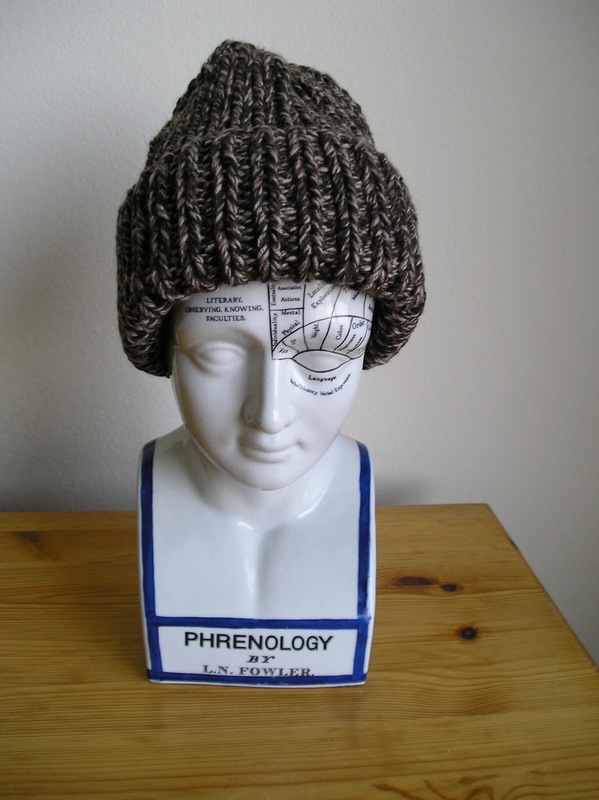 great pattern and I would like to knit this hat with a size “6” (bulky) yarn. How many would I need to CO and how would I adjust the pattern?? Please help! I just wanted to clarify that I meant you should only use one strand of the bulky size 6 yarn, not two. Cheers!